If someone want to fill an “Naqsh” or “Taweez” he can not fill that without the proper knowledge of “ilm ul adad” also called knowledge of the digits. In this post I will tell you the way to find out any Name Digit and how to use this name digit to know about complete life status of a person with the help of numerology. Also share a Software for Ilm ul Adad by using this software you can easily find the digit of your name or any name. At the end of this article I will also provide Download Link of very famous book “Ilm Ul Adad Ke Karishmay” for readers who want to know lot of about ilm ul adad. If you still have any problem to know digit of your name please comments your complete name I will tell you the right digit of your name. 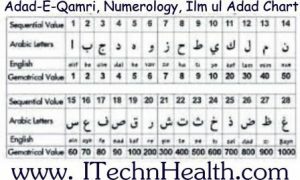 If you want to get the numerical value of any Name, you will have to do first of all get those Alphabets from of name from “Abjad e Qamri Chart”. Chart of “abjad e Qamri” is given below. Now I will tell you how to produce the name digit of “IQBAL AHMED”. 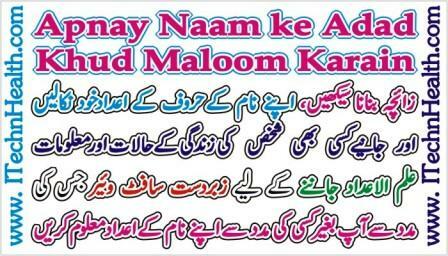 Iqbal Ahmed k naam k “abjad e qamri ye hain. “Alaf” , “Qaaf” , “Baa” , “Alaf” , “Laam” , “Alaf” , “Hey” , “Mem” , “Dal”. The digit of these words are 4+40+8+1+30+1+2+100+1= 187. Now we separate these digits like this 1+8+7= 16. 16 is also a compound digit we need to separate this digit also like 1+6=7. This way we find that the digit value of Iqbal Ahmed is 7. To know about 7 digit status you can see this from chart given below. 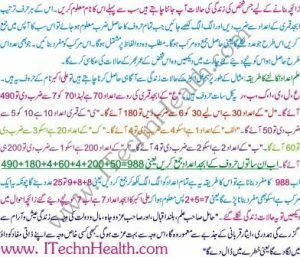 These digit help people for use in Istikhara and treatment of diseases. Take the digits of the name of the patient and also take the name of that “Day” on which patient came and questioned about it. Take these both names and bring up the digital vale. Then add the value of the both names and then divide with “4”. If the “3” lefts behind, that means its demonic problem, if “2” left, that means its internal fever, and if it divides totally with “4” it means its some kind of magic. Example:- Ilm ul adad se Ahmed ka namm ka adapt maloom karma ka tareqa ye ha. Ahmed “alif” = 01 , “Ha” = 8 , “Mim” = 40 , “Dal” = 4 is tara total adapt howa ahmed ka 53 (1+8+40+4= 53 ). Ab 53 ko alag alag kar k lakian 5+3=8 is tarah humain maloom ho jaye ga k Ahmed k naam ka ilm ul adad se adad “8” banta ha ab necey die ge chart se Adad “8” ki zindigi k muqamal halat zindagi maloom kar saktain hain. Majooda Zamaney main Insan Haqeqi koshi aur sakoon se door hain. Allah ki yaad main jo sakoon ha wo dolat ky gazaney hasal kar k nai mil sakta. Allah talah k “Asma ul Husna” main jis naam k b ward kia jaye woi naam fida mand hota ha. Allah ne ilm ul adad ki roshni main jo tariqa bataya ha is se nataaej bout betar aa saktain hain. Ilm ul Adad se pareshanion k katamey, masahel k hal aur haqaqi koshi k hasool k lehe akseer se kam nai ha. Allah Tahla k naamoun ko tarteeb war laik kar har naam k adad nikalain, pir apney naam ya kisi b problem k naam ky adad nikalain. Ab in adad k barabar Allah k jis naam k adad houn woi adad aap k lehe mofid ho ga. Yani asi naam ka ward karney se aap k problem hal ho saktain hain. Wared karney ka tareqa bout asan ha. Har Namaz k bad 99 bar Allah k aus naam ka wared kia jaye jo aap k naam k digit se match karta ho. Is k bad Allah se dua ki jaye Inshallah zaroor pori ho ge. For example Abdual Aziz k naam k adad 201 hain lehaza Abdul Aziz saib Asma ul Husna “Ya Nafe” ka wared Karin. 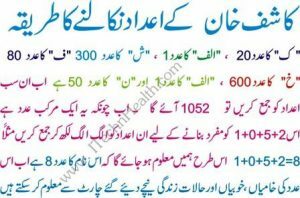 Tariq Mehmood k naam ka digit 408 ha aur Asma ul Husna main kisi b naam k mofrd naam k adad 408 nai hain, is ka hal ye ha k aap 2 ase naam talash Karin jin ko add karney se 408 digit banta ho. Wo 2 name “Majid” aur “Rafia” hain jin k adad “57” aur “351” hain in ko add Karin tu 408 ban jata ha. Is lehe Tariq Mehmood Saib “Ya Majeed” “Ya Rafia” ka warid karain tu ye in k lehe bout behtar ho ga. Here I am sharing a link where you can download a fully functional evaluation copy of Personal Numerologist and Professional Numerologist software. These software allow you to fully use and evaluate each name digit very easily. In this software you can display, print or save any report charts. This software also provide Numerology Reports, 2 Relationship Reports, 2 Yearly Reports and 2 Numerologist Charts for anyone you want.